In this collection of essays – number 100 in Open Court’s Pop Culture And Philosophy series – Scott Farrell joins several leading authors and philosophy scholars in an in-depth philosophical examination of the motives and actions of two of today’s most popular superheroes, Superman and Batman. The chapter written by Scott Farrell is entitled “A Cape And A Code.” In it, Scott uses the tenets of the code of chivalry to determine whether the Man Of Steel or the Dark Knight live up to the ideals of the knightly code of honor in their quests for justice. Batman or Superman? Which of these shining examples shows us the better way to fight terrorism? Which one is a morally better person? Who’s more rational? Who makes a better god? Who’s more mentally healthy or are they both irredeemably psychotic? Since both Batman, the megalomaniacal industrialist, and Superman, the darling of the media, sometimes operate outside the law, which of them qualifies as the better vigilante? Do either of them ever truly uphold the law? Which one makes a better role model and a more inspiring myth to define our culture? 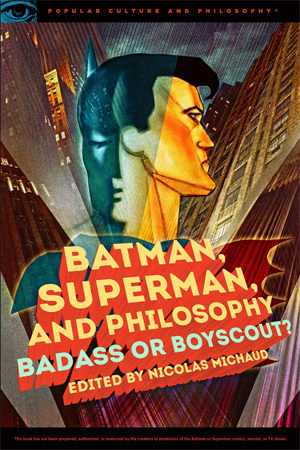 Twenty-some philosophers try to decide who wins—Superman or Batman. Some of them give it to Batman, others to Superman, and others make it a tie. They all lay out the evidence so that you can decide. Visit Open Court Books Pop Culture And Philosophy series website to find out more about this title, and all the book in the series.